Escada has tapped Rita Orato be its new ambassador as the German label refreshes its image under new global design director Niall Sloan. Ora is to appear in Escada’s spring campaign alongside the brand’s Heart bag, which the singer customized in her favorite bright red shade. The bag will be available online and in stores on March 26 and retails at 1,199 euros. “Escada was a brand that I grew up with, I remember seeing their campaigns as a child and thinking the women look so powerful yet relatable. The brand has always championed the message of designing for a woman by a woman,” Ora said in an exclusive interview, speaking of her admiration for Escada founder, Margaretha Ley. In the campaign, Ora wears looks with a distinct Eighties-inspired aesthetic, including bright, strong-shouldered suits and a rainbow-hued monogram trench coat. Ora’s Heart bag will also star in the campaign, and 15 euors from the sale of each bag will be donated to Women for Women, a charity that supports women in conflict areas like Kosovo, where Ora was born. “The charity helps women get back on their feet and that’s very special to me. It goes back to Escada’s DNA and what they stand for,” the singer said, adding that she is excited to introduce her fanbase to the brand. 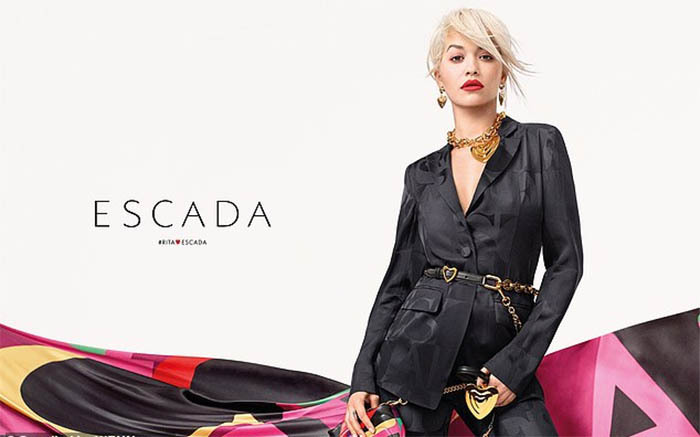 “It’s a natural growth of where Escada is going with their demographic and I think it will only make my audience go wild,” she said. Ora has been flexing her design skills as of late. Earlier this week, she also announced that she teamed with Italian footwear designer Giuseppe Zanotti to co-design a capsule of statement pool slides, stiletto sandals and pointed-toe mules.